Fill the Aquadoodle pen with water, run the nib over the mat and see your lines and designs appear – it’s magic! No mess, no ink, no stains – once the water has dried, drawings fade away, ready to start all over again! 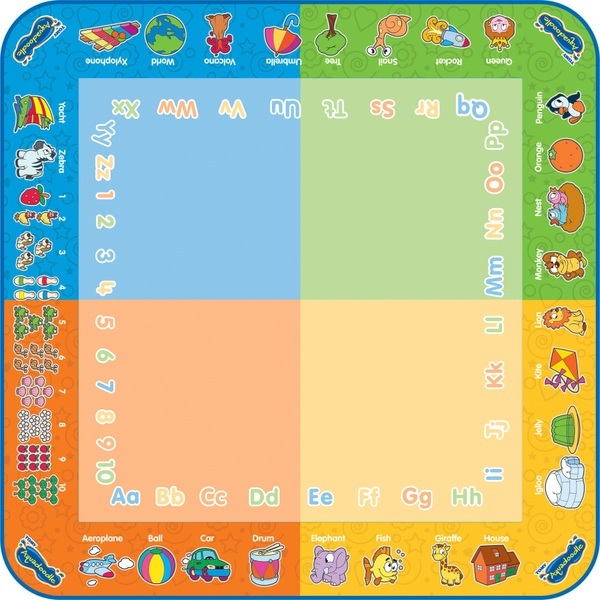 Classic Colour from Aquadoodle brings four contrasting corners together on the one mat for hours of magical drawing fun and creativity – but with no mess to spoil the party! Simply fill the Aquadoodle pen with ordinary tap water, run the nib over the magic mat and see the colours appear! Any water that does run off the mat, runs clear. No mess, no stains, nothing to worry about. As the drawing dries, designs fade away, ready for the mat to be used again, over and over again. When you need to, just refill the Aquadoodle pen with water and go! Around the edges, kids will discover lots of different shapes and colourful characters to copy and inspire. Combine them into a story, perhaps, then start all over again. Inside the border are hidden letters and numbers to trace and colour over – a great way to learn to copy basic writing strokes. When they’ve finished, the mat folds up for easy storage, ready for the next time.